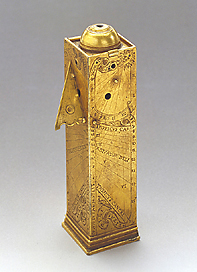 This sundial is in the shape of a column with a quadrilateral cross-section. It has a dome-shaped lid which, when opened, can be seen to contain a small compass. The column is provided with a plumb-line which allows the instrument to be kept in a vertical position. The faces of the column bear the gnomons which project their shadows on the hour lines inscribed on its surface. The instrument is calibrated for a latitude of 48? (Munich, Vienna), suggesting that it originated in the German lands.